WIND-WHIPPED dust encircled us as we descended into Weano Gorge — one of several deep incisions in Karijini National Park. On the gorge floor, a narrow passageway led to a large, circular chasm of polished red and grey rock, opening out to a crystal-clear pool. I stood in wonder with my wife Debbie and our three children Damian, 12, Emily, 8, and Joshua, 7, the red cliffs towering above us. We were alone, captivated by the majesty of our discovery in the far north-west of Western Australia. It was day 74 of a 30,600 km driving adventure that would span 23 weeks and take us from our home in suburban Melbourne, around the perimeter of Australia, and deep into its red heart. The mystique of the land and the joy of exploring new places was something we would experience many times — walking among seals at sunset on Kangaroo Island, sitting in silence on the shimmering white crust of Lake Eyre and playing like dolphins in the sparkling rock pools of Litchfield National Park. Having travelled overseas, Debbie and I had agreed early in our marriage to explore our own vast continent, but for years it had remained a dream. Job security, finances, family and house considerations and a multitude of unknowns chained us to our suburban routine. But drawn by the challenge, we finally dared to make the break. For more than a year we read books, studied maps, worked on getting our four-wheel-drive and camper trailer mechanically sound and gathered all the equipment we’d need. Our budget of $15,000 for 23 weeks travelling allowed for about $650 a week. Our aim was simply to see as much of the country as we could and not be deterred by dirt roads, dust or bad weather. And so we headed west one April day last year, determined that our pace would be set not by the clock but by our hearts. We prepared all our meals and didn’t spend long in towns, stopping only in the larger ones to stock up on food and supplies at shops where we could take advantage of specials. Bush camps and national park visits helped us save money that would otherwise have been spent on caravan park fees. What we saved by taking advantage of free camping — often in rest areas, beside rivers or on beaches —enabled us to enjoy special treats like boat tours, a helicopter flight over Purnululu (Bungle Bungle) National Park and a day out on the Great Barrier Reef. Carrying tarps and tents meant we weren’t restricted to our camper trailer. By parking it, we could explore places like Kangaroo Island and the Oodnadatta Track, where rough, corrugated roads might otherwise have denied access. For the children, travelling was an education in itself. Their teachers at home had been reluctant to give them too much work, encouraging them instead to keep diaries, to relate maths to the trip and to learn about the places they visited. Mind you, keeping diaries focused wasn’t always easy. After a fantastic day climbing Uluru, Joshua devoted an entire entry to the special dinner we ate that evening and Damian wrote: “I can’t tell if we were happy or sad that we were back on the ground, but we were very tired.” Their diaries are a real treasure. We wanted our children to experience new things, and to learn about themselves, their relationships and their country. But we were all enriched by the experience and in the process, developed a better understanding of Australia, its history, geography and geology, and the weather that shapes it. 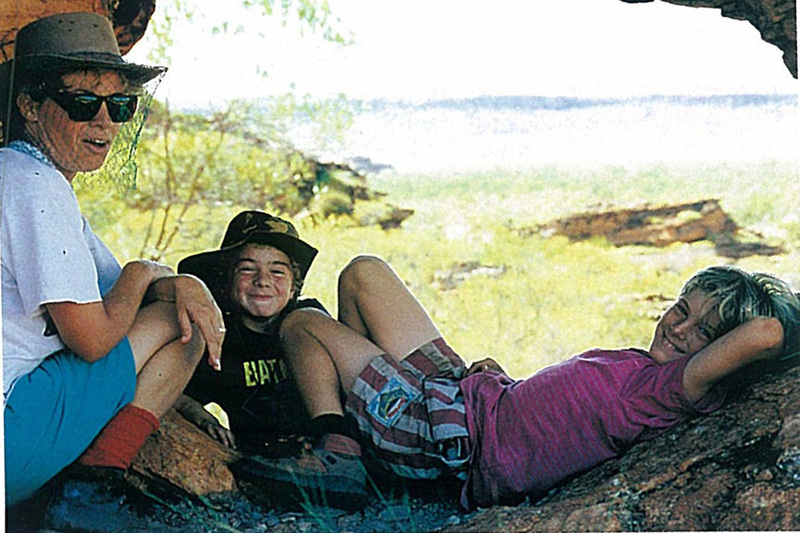 We have particularly fond memories of Windjana Gorge National Park (WA), the Devils Marbles and Ormiston Gorge (Northern Territory), and Noah Beach (Queensland) —of flickering campfires and the aroma of camp-oven damper. A glass of red or a good cuppa provided the opportunity for fostering new friendships, swapping travel tips or just having fun. The children were often “adopted” by elderly couples they befriended, and the didgeridoo Joshua bought in Darwin became a feature of many camps. We wanted to share our experience with other AG members in the hope that they might be inspired to give it a go too. It’s brought our family closer together. We’re also more confident, buoyed by the fact that we have overcome obstacles and achieved what for many will always remain a dream. And we came in under budget —spending just $12,600, or $550 a week. Towards the end of our six-month adventure, Joshua asked me: “Dad, when you grow old, can I have your car so I can travel around Australia?” “Sorry Josh, the car’s already booked,” came my reply. This story was published in Issue 40 of Australian Geographic (1995).